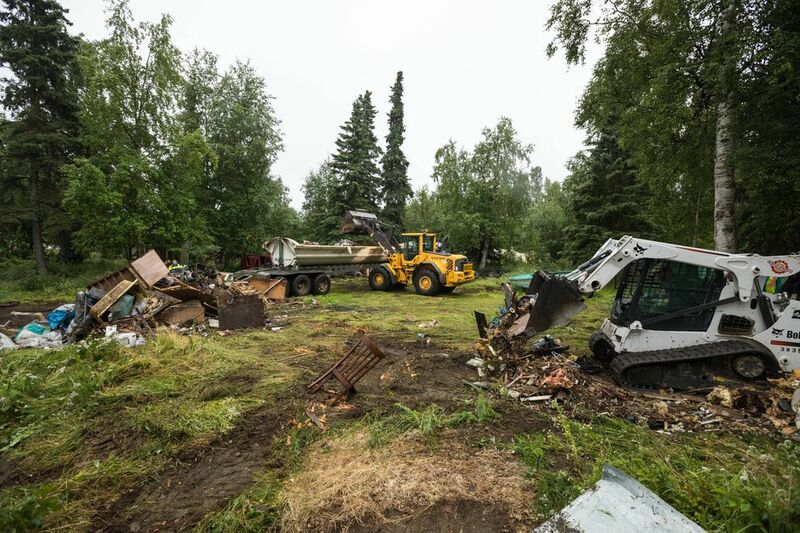 With a court order in hand, city contractors in yellow vests drove excavators around a rotting cabin on a dead-end road in South Anchorage this week, scooping up huge piles of junk. It was the kind of cleanup that hadn't happened in years. 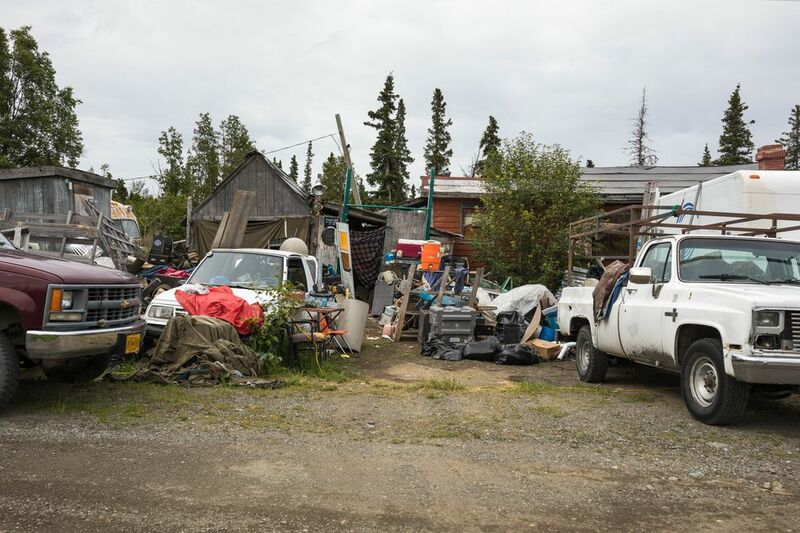 Since taking office in 2015, the administration of Mayor Ethan Berkowitz and the Anchorage Assembly have been exercising legal and financial methods to get the owners of abandoned and blighted properties to secure, clean up and fix what they own. Officials say the properties attract crime and drive down the value of neighboring homes. The effort has so far included court orders, a new pool of cleanup funds and the boarding-up of buildings that have become magnets for crime and other problems. City attorneys are exploring different aspects of the foreclosure process as a way to apply pressure and also repay city expenses. Recently, the city came up with a "priority list" of the 10 properties that officials regard as some of Anchorage's worst nuisances. The cabin and surrounding land north of Huffman Road, which is slated for tax foreclosure this fall, was near the top of the list. The city paid $10,500 to the contractor for the cleanup, which started Wednesday morning. About 70 tons of trash and junk were removed, costing the city roughly $4,000 in dump fees. City attorneys hope to recover some of the money in a future foreclosure sale. Neighbors, who had complained for years about loud all-night parties, squatters and camping, fires and repeated calls to police and paramedics, cheered the city's work. "At one time, there were four campfires and 13 people living out of tents and running generators at night," said Tony Jackson, who lives across the street. "It was so loud, we were unable to open our windows to our house all summer long." Such cleanups were more common in the 1990s and 2000s through a federal program aimed at urban renewal. The city usually got involved only after neighbors complained. Then that money dried up. The last cleanup of junk on a property may have been in 2007, when news reports documented a cleanup at a property known for a massive snowman called "Snowzilla." City law defines junk as anything that doesn't work or can't be used for its original purpose. Longtime code enforcement officers said that while the money went away, problem properties didn't, and have only gotten worse. Berkowitz took office in summer 2015. A year later, his administration pushed a new law that requires the owners of empty and abandoned buildings in Anchorage to register, pay fees and maintain buildings. In this year's city budget, the Assembly dedicated $200,000 to the cleanup of blighted properties. A team of city attorneys, real estate managers, code enforcement officers and development officials have been planning how to spend the money, and also creative ways to get it back. Officials decided to focus this summer on abandoned properties embedded in neighborhoods that have substantial trash and other problems, said Rebecca Windt-Pearson, the city attorney. After the Northern Lights Inn was demolished in 2017, Windt-Pearson said this has been the main thing that elected officials hear about. "They're everywhere in town, every single Assembly district," Windt-Pearson said. "Every Assembly member is hearing concerns about properties that have become targets for illegal activity, for junk cars, for illegal campsites." The properties on the city's top 10 list have messy histories. Several have huge fines stemming from years of allegations of illegal junk stockpiling. In other cases, owners have died or gone missing, and the houses have been overtaken by squatters. By 10 a.m. Wednesday, much of the stuff at the property north of Huffman Road had been cleared or moved into piles. There were mattresses, rotting wood and furniture, skis, rugs and books, piles of gas cans, tires and chest freezers. A large excavator pushed it all together with a bone-chilling crash. The cabin was boarded up and does not have heat, electricity or water. The cleanup itself happened quickly. But the process leading up to the moment was not. The city spends years — or in this case, decades — trying to get property owners to do the cleanup themselves, Windt-Pearson said. There are often a lot of intersecting issues involved, she said. Most property owners do respond to some pressure, Windt-Pearson said. But others can't, or won't. The South Anchorage property that was cleaned this week has been on the radar of city officials since the 1990s. The longtime owner, Robert E. Lee Sr., began promising to clean up the property in 2013, court records show. The city had offered him free landfill passes to help do it. Jackson, the neighbor, said he'd watched different people come and go from the property, dumping trash and vehicles and burning things. People claimed to be friends of Lee's who were there to clean it up, but that never happened, Jackson said. In March 2017, a city hearing officer fined Lee Sr. $11,100 and ordered him to stop using the land as a junk and salvage yard. Once the city dedicated money to cleanups, pressure ramped up even further. City attorney Samuel Severin wrote in a court motion in May that it appeared the only way to solve the problem was for the court to allow the city to go in and deal with it. "It's finally time to clean up the mess and come into compliance with the law," Severin wrote to the court. Records list Lee Sr.'s address as an assisted living facility about 2 1/2 miles west of his former home. In April, a friend of Lee Sr.'s delivered a handwritten note to Severin. The letter explained Lee Sr. had suffered a stroke in August 2016 that left him with brain damage and paralysis, and that he could not afford an attorney. "I cannot fully comprehend or recall any of this matter and I am not able to understand the summons sighted (sic) above," Lee Sr. said in the letter, which he said a friend prepared for him. Lee and his son, Robert E. Lee Jr., have been involved in an ownership dispute over the property since 2014 with another man, David Parker. An attorney for Parker did not respond to requests for comment. There was no listed attorney or contact information for Lee Jr.
For city officials, one catalyst for more aggressive action came in September 2017, when neighbors of a house in Bear Valley that has been fined hundreds of thousands of dollars over the years and accused of being an illegal junkyard came to an Assembly meeting. The neighbors implored the Assembly to do something. City officials are now trying to work with the Bear Valley property owner to come up with an estimate on how much it would take to remove the junk, including dozens of vehicles and mounds of appliances. In the past, officials had pegged the cost at about $50,000. But Windt-Pearson said it's likely that property, described as one of the city's longest-running nuisance properties, will see the next big cleanup. 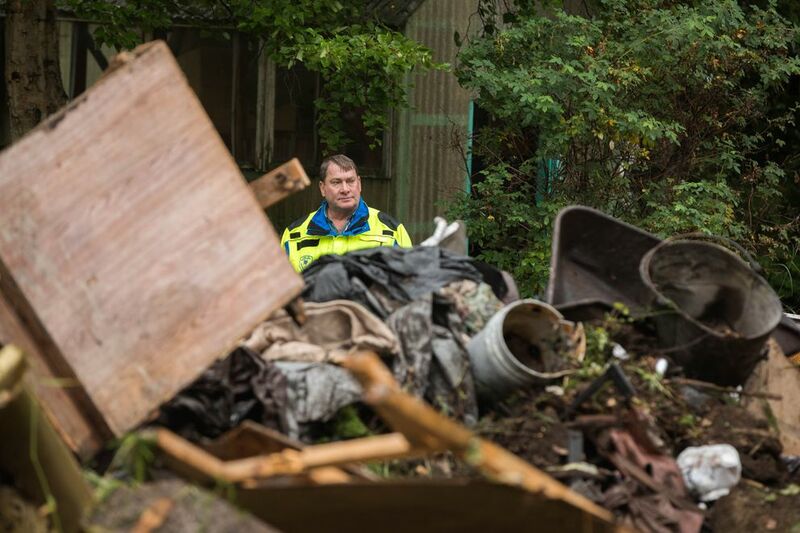 — A house in the Russian Jack area had household garbage piled up around the front door. Richard Fern, the municipality's lead land use enforcement officer, said he brought over garbage bags and asked the owner to fill them. When he came back, the bags were full and the place was much tidier, Fern said. 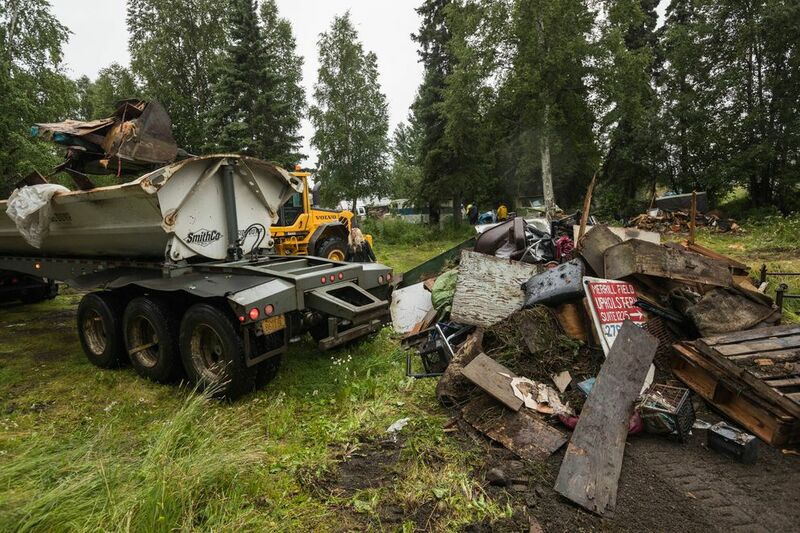 — A house in Eagle River with junk problems was cleaned up after the owner's family came from the Lower 48 and moved stuff into a dumpster, Fern said. — A property in the Abbott Loop area, whose owner has died, has extensive junk on it and would likely be extremely expensive to clean, according to Fern. Fern said he's been in touch with the owner's children and with a developer who may be interested in buying it. — A small red house in Mountain View, owned by former Anchorage entrepreneur Terry Stahlman at the time of his death in May, is slated for tax foreclosure this fall. The property will likely be cleaned at that point, Windt-Pearson said. — A cabin in Mountain View was owned by former Anchorage disc jockey Don Nelson. Nelson was beaten there in 2016 by intruders and later died of his injuries, and the house has been in ownership limbo and overtaken by squatters. The house is now slated to be demolished by the city, in part using the cleanup fund, Windt-Pearson said. — The owner of a Tudor Road-area property with years of complaints of junk and people living in travel trailers in the driveway has until December to clean up the property, Windt-Pearson said. 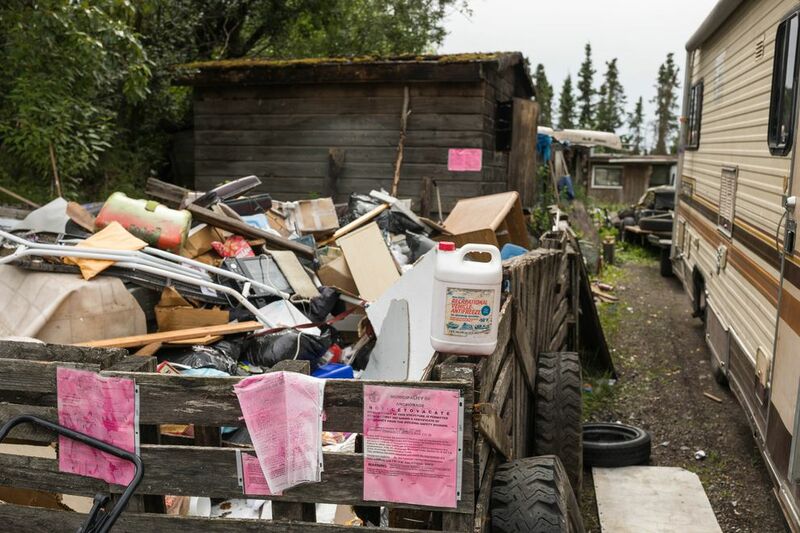 — In Nunaka Valley, one small house has been surrounded by trash and in a state of disrepair for more than a decade and has more than $200,000 in fines against it. The city renewed the case this year and recently met with the owner to determine her finances, court records show. Windt-Pearson said that may be a case where the city pursues foreclosure. If the pool of cash is still available next year, the city will move on to a new list of problem properties, Windt-Pearson said. Jackson, who lived across the street from the house north of Huffman, said he thought the city could use even more enforcement power. But he said the cleanup is a big first step in the right direction for his neighborhood and for others with similar problems. "It's a good deal," Jackson said. "It shouldn't take nine years either, though."